The increasing sunlight and warmth of springtime provoke buds and blooms amidst the trees, flowers, and grasses on land. Warm air and sunlight also beget warmer ocean waters and provoke blooms of the “grass of the sea”—phytoplankton. These tiny, plant-like organisms float near the ocean surface and turn sunlight and carbon dioxide into sugars and oxygen. In turn, they become food for the grazing zooplankton, shellfish, and finfish of the sea. 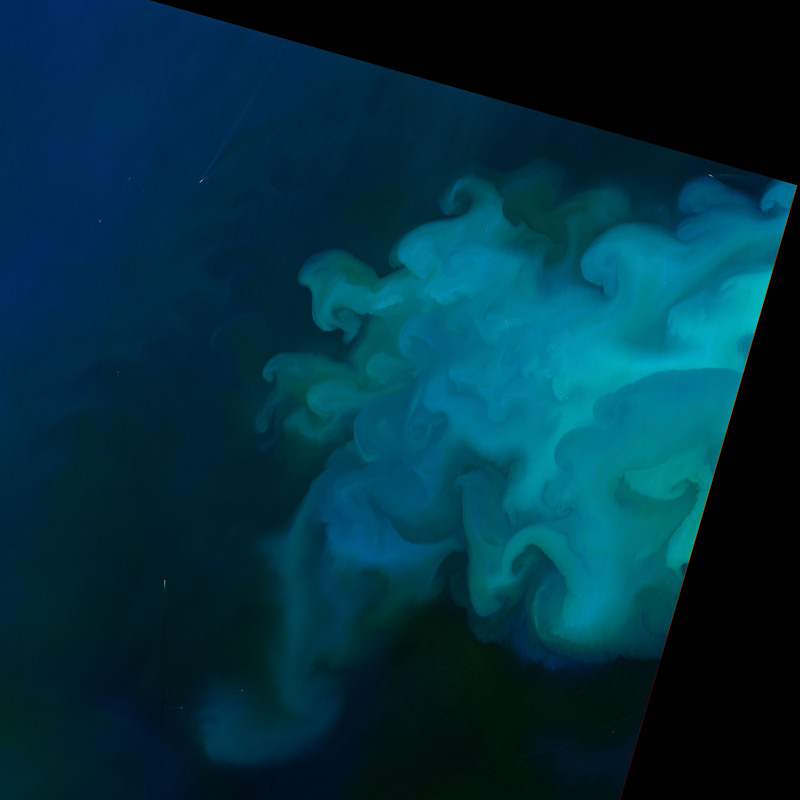 On May 5, 2018, the Operational Land Imager (OLI) on Landsat 8 acquired a natural-color image (top) of a phytoplankton bloom in the North Sea. The next day, the Moderate Resolution Imaging Spectroradiometer (MODIS) instrument on NASA’s Aqua satellite observed the same bloom in a wider context. Five days earlier, MODIS detected visible plumes of sediment moving through the area to the west. 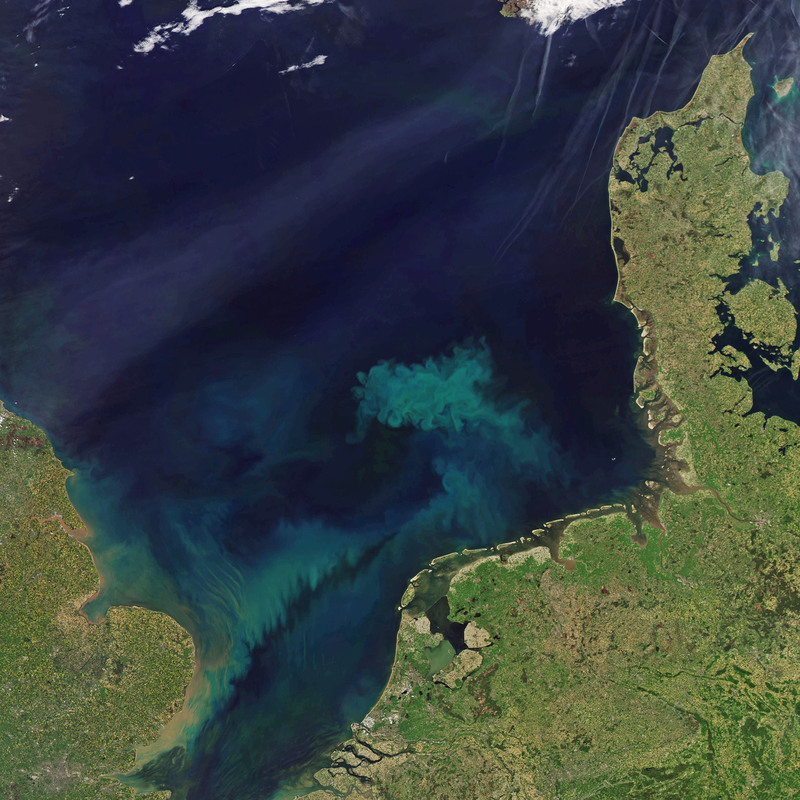 The milkier, lighter-colored waters are probably filled with coccolithophores, while greener areas may be diatoms. (It is impossible to know for sure without direct water samples.) 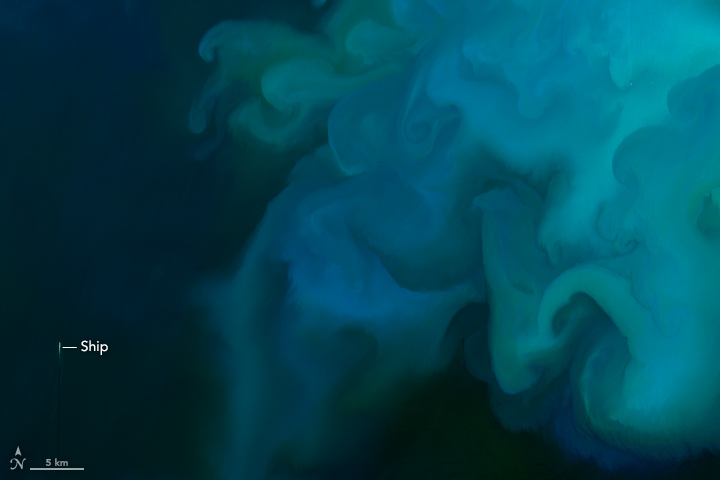 The brightness of the color may reflect the density of the phytoplankton, while the various swirls and shapes trace the intricate movements of currents, eddies, and tides. 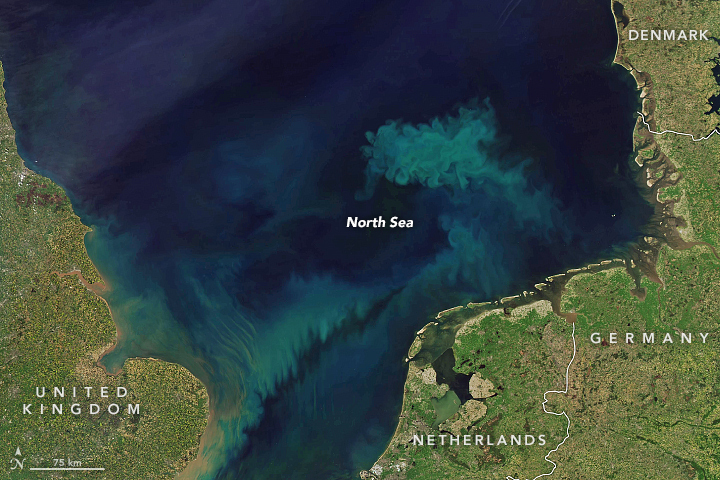 Phytoplankton are most abundant in the North Sea in late spring and early summer due to high levels of nutrients in the water. Melting sea ice and increased runoff from European rivers—a product of melting snow and spring rains—carry a heavy load of nutrients out to sea, while also freshening the surface waters. Intense seasonal winds blowing over the relatively shallow sea also cause a lot of mixing that brings nutrients to the surface. In a study published in August 2017, a research team from the United Kingdom found that primary production in the North Sea has declined since the late 1980s. The causes for less phytoplankton abundance are not entirely clear, but they appear to be related to decreased nutrients—thanks to less runoff from European farms and cities—increasing sea temperatures, and changing light levels. Whatever the cause, the decrease in primary production has coincided with a decrease in zooplankton and some higher forms of marine life that consume phytoplankton. At the same time, many fish stocks remained stable, probably due to better fisheries management amid the changing ocean conditions. Capuzzo, E. et al. (2017) A decline in primary production in the North Sea over 25 years, associated with reductions in zooplankton abundance and fish stock recruitment. Global Change Biology. NASA Earth Observatory (2011, February 17) As the Seasons Change, Will the Plankton? Scientific American (2010, April 14) What Causes the North Atlantic Plankton Bloom? Accessed May 7, 2018. UK Department of Trade and Industry (2001, August) Technical Report: An Overview of Plankton Ecology in the North Sea. Accessed May 7, 2018. NASA Earth Observatory images by Joshua Stevens, using Landsat data from the U.S. Geological Survey and MODIS data from LANCE/EOSDIS Rapid Response. Story by Mike Carlowicz.